In 1864 nickel was discovered on the banks of the Diahot River; with the establishment of the Société Le Nickel in 1876, mining began in earnest. To work the mines the French imported labourers from neighbouring islands and from the New Hebrides, and later from Japan, the Dutch East Indies, and French Indochina. The French government also attempted to encourage European immigration, without much success. The indigenous population or Kanak people were excluded from the French economy and from mining work, and ultimately confined to reservations. This sparked a violent reaction in 1878, when High Chief Atal of La Foa managed to unite many of the central tribes and launched a guerrilla war that killed 200 Frenchmen and 1,000 Kanaks. A second guerrilla war took place in 1917, with Catholic missionaries like Maurice Leenhardt functioning as witnesses to the events of this war. Leenhardt would pen a number of ethnographic works on the Kanak of New Caledonia. Noel of Tiamou led the 1917 rebellion, which resulted in a number of orphaned children, one of whom was taken into the care of Protestant missionary Alphonse Rouel. This child, Wenceslas Thi, would become the father of Jean-Marie Tjibaou (1936–1989). A 2015 documentary by Al Jazeera English asserted that up to 10% of New Caledonia's population is descended from around 2,000 Arab-Berber people deported from French Algeria in the late 19th century to prisons on the island in reprisal for the Mokrani Revolt in 1871. After serving their sentences, they were released and given land to own and cultivate as part of colonisation efforts on the island. As the overwhelming majority of the Algerians imprisoned on New Caledonia were men, the community was continued through intermarriage with women of other ethnic groups, mainly French women from nearby women's prisons. Despite facing both assimilation into the Euro-French population and discrimination for their ethnic background, descendants of the deportees have succeeded in preserving a common identity as Algerians, including maintaining certain cultural practices (such as Arabic names) and in some cases Islamic religion. Some travel to Algeria as a rite of passage, though obtaining Algerian citizenship is often a difficult process. The largest population of Algerian-Caledonians lives in the commune of Bourail (particularly in the Nessadiou district, where there is an Islamic cultural centre and cemetery), with smaller communities in Nouméa, Conné, Blambut, and Surianté. Education in New Caledonia is based on the French curriculum and delivered by both French teachers and French–trained teachers. Under the terms of the 1998 Nouméa Accord, primary education is the responsibility of the three provinces. As of 2010, secondary education was in the process of being transferred to the provinces. The majority of schools are located in Nouméa but some are found in the islands and the north of New Caledonia. When students reach high school age, most are sent to Nouméa to continue their secondary education. Education is compulsory from the age of six years. This context, combined with bad weather, has forced the operators in the sector to revise downwards their production target. Thus, the activity of mineral extraction has declined by 8% in volume year on year. The share of the nickel sector as a percentage of GDP fell from 8% in 2008 to 5% in 2009. A trend reversal and a recovery in demand have been recorded early in the second half of 2009, allowing a 2.0% increase in the local metal production. ^ ISEE. "Communauté d'appartenance – INSEE – ISEE / Recensement de la population de 2009 en Nouvelle-Calédonie" (XLS). Retrieved 24 August 2015. Société Aircalin, also known as Air Calédonie International, is a French airline and is the international airline of New Caledonia. It also operates domestic services in Wallis and Futuna. Including Wallis and Futuna, it operates scheduled services to twelve destinations in Oceania and Asia, including Japan. Its main base is La Tontouta International Airport. It is headquartered in Nouméa. Cannabis in New Caledonia is illegal, but is cultivated illicitly. Sources note that "hard drugs" are rare in New Caledonia, and their drug issues are primarily confined to cannabis, with local Kanak chiefs being anti-drug and working to eradicate cannabis plantations. The Congress of New Caledonia (French: Congrès de la Nouvelle-Calédonie), a "territorial congress" (congrès territorial or congrès du territoire), is the legislature of New Caledonia. It has 54 members who serve five-year terms, selected proportionally based on the partisan makeup of all three assemblies of the provinces of New Caledonia with a 5% threshold. FIBA Oceania Youth Tournament is a basketball tournament that take every two years between under-20 national teams of the continent. Association football has been regularly included in the Pacific Games, the multi-sports event for Pacific nations, territories and dependencies, since 1963. Until 2011 the competition was known as the South Pacific Games.Since 1971 the men's tournament has been held every four years, but was not played in 1999 due to contractual issues. In 2007, the men's competition doubled as the Oceania Football Confederation's preliminary qualifying competition for the 2010 FIFA World Cup. The men's tournament also became the Olympic qualifier for Oceania for the 2015 edition. The women's tournament was introduced in 2003, and has doubled up as the preliminary qualifying competition for the Olympic Games since 2007. Football has also been held at several editions of the Pacific Mini Games, starting with the first tournament in 1981. New Caledonia, a part of the French Republic, uses French as its official language, following the constitutional law 92-554 (June 1992). The thirty New Caledonian languages form a branch of the Southern Oceanic languages. Their speakers are known as Kanaks. This is a list of airlines currently operating in New Caledonia. 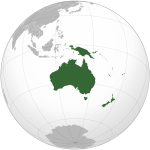 The Loyalty Islands Province (French Province des îles Loyauté) is one of three administrative subdivisions of New Caledonia encompassing the Loyalty Islands (French: Îles Loyauté) archipelago in the Pacific located northeast of the New Caledonian mainland of Grande Terre. The provincial government seat is part of the French territory of New Caledonia, at Lifou, which is 100 kilometres (62 mi) away. The Loyalty Islands are a collectivité territoriale of France. The province's 2014 population was approximately 18,297 inhabitants living on almost 2,000 square kilometres (770 sq mi). The native inhabitants are the Kanak and the Tavu'avua' peoples. New Caledonia Super Ligue is the top division of the Fédération Calédonienne de Football in New Caledonia. It is played as a double round robin between the top-4 clubs from the Division Honneur of Grande Terre and the champions of the Îles. The New Caledonia catshark or Kanakorum catshark (Aulohalaelurus kanakorum) is a catshark of the family Scyliorhinidae in the order Carcharhiniformes, known only from one specimen collected near southwestern New Caledonia in the western central Pacific Ocean. The holotype measured 79 cm (31 in). The New Caledonia catshark is a rare and vulnerable inshore catshark found around coral reefs. The New Caledonia national football team is the national team of New Caledonia and is controlled by the Fédération Calédonienne de Football. Although they were only admitted to FIFA in 2004, they have been participating in the OFC Nations Cup since its inception. They have been one of this relatively small region's strongest teams, finishing second in 2008 and 2012, and third in 1973 and 1980. They were the top ranked OFC nation at number 95 in September 2008, making them only the fourth country from the confederation to have reached the global top 100. New Caledonia wattled bat (Chalinolobus neocaledonicus) is a species of vesper bat (family Vespertilionidae) in the genus Chalinolobus. It is found only in New Caledonia. The New Caledonian barrier reef is located in New Caledonia in the South Pacific, and is the longest continuous barrier reef in the world and the second largest after the Great Barrier Reef of Australia. The New Caledonian barrier reef surrounds Grande Terre, New Caledonia's largest island, as well as the Ile des Pins and several smaller islands, reaching a length of 1,500 kilometres (930 mi). The reef encloses a lagoon of 24,000 square kilometres (9,300 sq mi), which has an average depth of 25 metres (82 ft). The reefs lie up to 30 kilometres (19 mi) from the shore, but extend almost 200 kilometres (120 mi) to the Entrecasteaux reefs in the northwest. This northwestern extension encloses the Belep Islands and other sand cays. Several natural passages open out to the ocean. The Boulari passage, which leads to Noumea, the capital and chief port of New Caledonia, is marked by the Amédée lighthouse. The New Caledonian lorikeet (Charmosyna diadema) is a potentially extinct lorikeet endemic to the Melanesian island of New Caledonia. Nouméa (French pronunciation: ​[nume.a]) is the capital and largest city of the French special collectivity of New Caledonia. It is situated on a peninsula in the south of New Caledonia's main island, Grande Terre, and is home to the majority of the island's European, Polynesian (Wallisians, Futunians, Tahitians), Indonesian, and Vietnamese populations, as well as many Melanesians, Ni-Vanuatu and Kanaks who work in one of the South Pacific's most industrialised cities. The city lies on a protected deepwater harbour that serves as the chief port for New Caledonia. At the August 2014 census, there were 179,509 inhabitants in the metropolitan area of Greater Nouméa (French: agglomération du Grand Nouméa), 99,926 of whom lived in the city (commune) of Nouméa proper. 66.8% of the population of New Caledonia live in Greater Nouméa, which covers the communes of Nouméa, Le Mont-Dore, Dumbéa and Païta. Zealandia (), also known as the New Zealand continent or Tasmantis, is an almost entirely submerged mass of continental crust that sank after breaking away from Australia 60–85 million years ago, having separated from Antarctica between 85 and 130 million years ago. It has variously been described as a continental fragment, a microcontinent, a submerged continent, and a continent. The name and concept for Zealandia was proposed by Bruce Luyendyk in 1995. Zealandia's status as a continent is not universally accepted, but New Zealand geologist Nick Mortimer has commented that "if it wasn't for the ocean" it would have been recognized as such long ago.The land mass may have been completely submerged about 23 million years ago, and most of it (93%) remains submerged beneath the Pacific Ocean. With a total area of approximately 4,920,000 km2 (1,900,000 sq mi), it is the world's largest current microcontinent, more than twice the size of the next-largest microcontinent and more than half the size of the Australian continent. As such, and due to other geological considerations, such as crustal thickness and density, it is arguably a continent in its own right. This was the argument which made news in 2017, when geologists from New Zealand, New Caledonia, and Australia concluded that Zealandia fulfills all the requirements to be considered a continent, rather than a microcontinent or continental fragment.Zealandia supports substantial inshore fisheries and contains gas fields, of which the largest known is New Zealand's Maui gas field, near Taranaki. Permits for oil exploration in the Great South Basin were issued in 2007. Offshore mineral resources include iron sands, volcanic massive sulfides and ferromanganese nodule deposits.